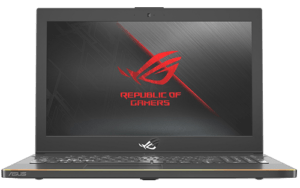 This is the Asus Zephyrus M – GM501. 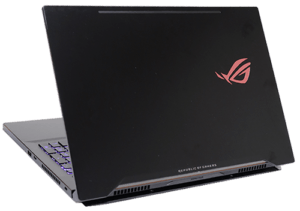 We saw the original Zephyrus last year, it’s kind of a thin and light GTX 1080 Max-Q laptop. It was really powerful and really expensive. This is a much more affordable version of that whole design. This is very similar in exterior aesthetics to the original Zephyrus, but they made some major changes with the inside. It’s still a really well-built laptop measuring 5.5-pounds with 15″ display. The top lid is fully aluminum and the bottom plate is a very durable polycarbonate. 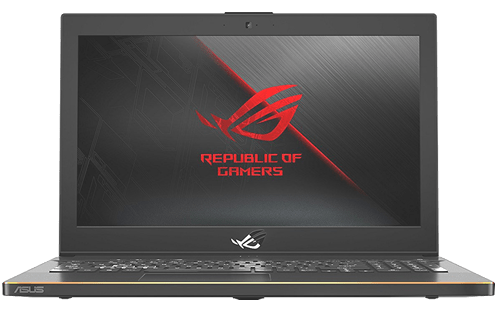 The ROG logo still lights up red, it’s not a very obnoxious red, it’s very subtle, but it does still light up. The entire top panel has a brushed texture to it that looks pretty nice. As far as port selection is concerned, there is a decent amount of I/O. It has a lot of USB-A, four of them actually. It also supports Thunderbolt 3 but does not have an SD card reader or a mini DisplayPort. The AC charging adapter is not in a great position, it connects in the middle of the left-hand side and then the cable runs up the side interfering with the other ports. This doesn’t seem to make a whole bunch of sense, but hey, what do I know? Getting into the interior of this machine we’re looking at a pretty big change on the input devices. 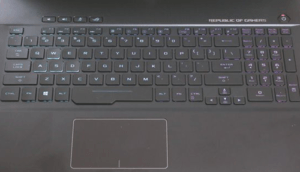 The keyboard and the trackpad from the original 2017 Zephyrus did not have the best positioning, they were shifted from the bottom of the keyboard deck to allow for better cooling for the 1080. The new Zephyrus M is significantly improved with it’s more traditional layout of everything. 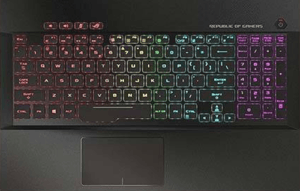 The keyboard is great and very easy to get used to, the spacing is good and the keystrokes are responsive. 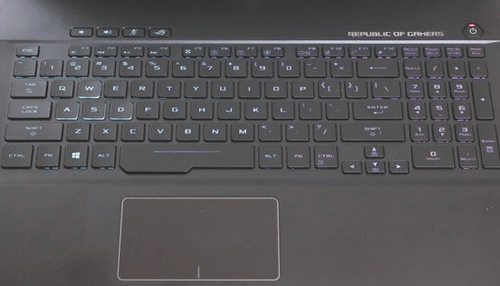 The narrow number pad and the small arrow keys may be a bit weird to look at, but they actually type out very well. Now, if you are a normal number pad user you may feel a bit strange with the narrower setup on this keyboard. 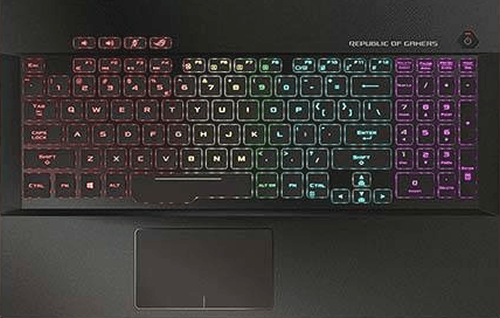 The backlighting on this keyboard is not super customizable or very bright, but it does have a nice subtle glow that’s easy on the eyes. The trackpad is also solid with its Windows Precision drivers. It has a nice glass texture and the button mechanics are on-point. It would be nice if the trackpad was a little larger, not that it’s small or anything, but in this genre of 15″ gaming laptops this is one of the smaller ones, but overall the inputs are good. I have mixed feelings about the display. It’s a great panel and it’s really fast at 144 Hertz. Of all of the 6-core gaming laptops we’ve tested so far, I think this one has the overall best panel for gaming. This one has the fastest response rate at 3 milliseconds, but it’s not just that, it’s the colors. They’re a little bit more vibrant and games just look really good on this panel. The bezels, however, are, unfortunately, quite big. It’s not that they are abnormally thick, but they are substantially thicker than their competitors and it just doesn’t look as nice. This panel does get reasonably bright at 300 nits. Its color gamut is nice, but not super impressive at sRGB 91% and Adobe RGB at 62%. 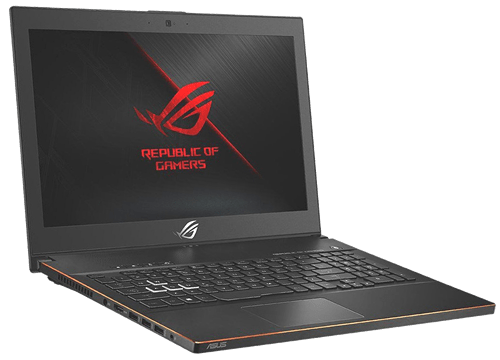 You can adjust the color but if you want to do any long-term video or photo editing you’ll have to hook up an external monitor or skip on this laptop completely. However, the screen is excellent for gaming. A unique feature is that this laptop can switch between NVIDIA G-Sync and NVIDIA Optimus with software. Normally, you have to choose between one or the other and your laptop couldn’t have both, but this one can switch between the two. if you don’t know what those are, G-Sync is tech that allows your laptop to reduce visual artifacts when it’s in games. So, it just kind of smooths out the gameplay, it looks nice at lower frame rates. NVIDIA Optimus is tech that enhances, or extends, battery life. Instead of using the discrete 1070 GPU, it will switch over to the weaker, 0n-board GPU when it’s not doing something intense and this extends battery life. To get inside of this thing is pretty simple. You just need to remove some screws and the panel comes right off with ease. 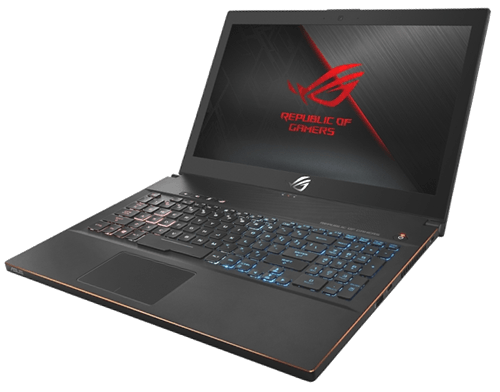 You get two RAM slots, two drive bays, one is an NVME and the other is a 2.5″ 512 GB SSD SATA and it has a new Intel 9265 WiFi card. The battery is quite small. It’s a 55 watt-hour pack and a little disappointing in a unit like this. 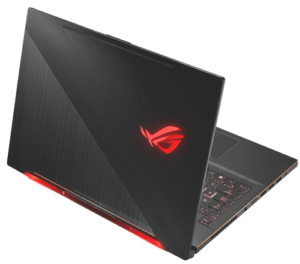 You’re only good for about 3.5 hours with the screen at 75% and with NVIDIA Optimus, and with G-Sync you’re only looking at 2.5 hours. The performance of this laptop is really good. The GTX 1070 with the new 6-core CPU from Intel is a really good combination. The CPU is excellent for multi-core applications. The GPU is also really good. It basically has the third most powerful GPUs for laptops on the market right now. You will get really good frame rates across all titles at 1080p. And when you pair that with a 144 Hertz screen, stuff just looks awesome. Since it’s a regular GTX 1070 and not a Max-Q version, the thermal output should be a little bit higher, but the Zephyrus has a feature where when you lift the lid the bottom panel actually opens up and gives it better thermal characteristics. This allows for the temps in benchmarks and gaming to be lower than its competitors, not by a lot, but it is noticeable. The fans can actually be very quiet if you want. You get software control on balance mode. It’s reasonably quiet but on overboost, the fans can get quite loud but you get better temperatures. The speakers on this laptop are located on the bottom and sound better than expected. Even though they are downward-firing speakers, they do sound much better than I thought, and even the bass is notable. With the Zephyrus M, you’re getting a device that is a better value this year than it was last year with the original. You are ending up with really strong performance while spending a lot less money compared to the previous generation. You’re still going to have to pony-up $2,000, or more, but overall, it’s a really great laptop.